Community Policing is not only the new term in the vocabulary of Ukrainian Patrol Police officers, from now on it is their new philosophy. The model of interaction and close cooperation between Police and community was presented today, on April 13th at the Media Center of Patrol Police in Kyiv. “Police is an organism oriented on service and help”, stressed the Head of National Police, Khatia Dekanoidze, presenting the Community Policing concept to guests and media. She also highlighted one of the key areas of the project – cooperation with schools. “It is important that we started talking with our younger generation. 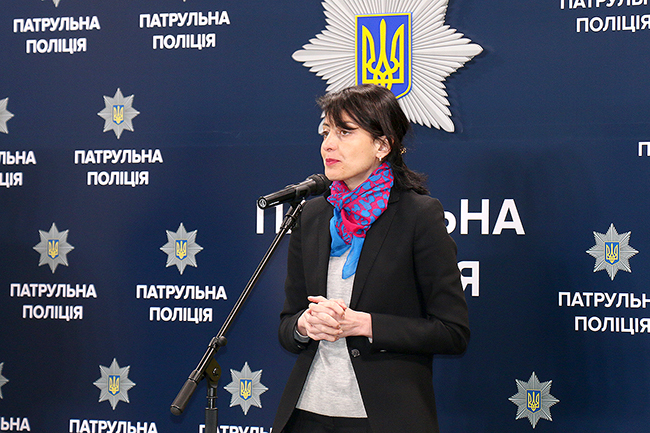 Kids at school should have a clear understanding of what the National Police is and what is the dialogue between police and public”, underlined Khatia Dekanoidze calling upon the school of Kiev and other cities to initiate joint projects and work closely with the Patrol Police. “Police is a reflection of society and the Community Policing is a basic function of policing in all democratic countries. Everything is built upon it”, highlighted the Deputy Head of EUAM, Hugues Fantou. “EUAM have already provided trainings for Patrol Police and district officers on Community Policing. We will continue our support to the National Police contributing to the reform of the civilian security sector”. The Head of National Police thanked international partners for their active participation and enthusiasm in preparing and implementing the Community Policing project.